Pack size: 20 g/sachet. Other pack size sachets can be produced accordingly. 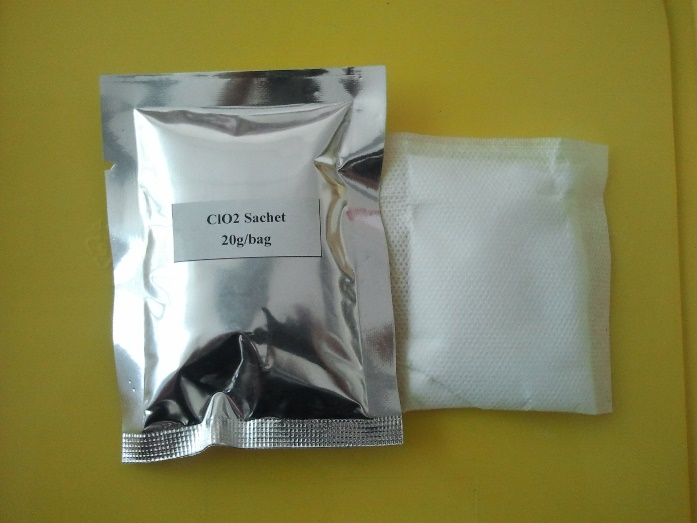 Chlorine Dioxide (ClO2) Sachets are a chlorine dioxide delivery agent product for use as a deodorizer. The specific powders are impregnated in the sachets. When spray water to the sachets, the sachets produce chlorine dioxide gas to destroy unpleasant and unwanted odors at their source quickly. It is better for severs odor places and requirement for removing odor quickly. The gas can be released completely in 20 to 30 hours. The sachet absorbs water to release chlorine dioxide gas to environment for odor removing. The user simply opens the outer package, hangs, places or adheres the inner sachet in the area to be deodorized, and the unwanted odors disappear. It is better for severs odor places and requirement for removing odor quickly. You can choose the sachet version (Fast-release and Extended-release) accordingly DO NOT OPEN INNER SACHET!! !